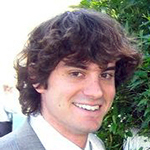 Former EFree Graduate Student Max Murialdo has aceptted a postdoctoral position at Lawrence Livermore National Laboratory. He will be working on materials science problems associated with additive manufacturing. Earlier this year, Max successfully defended his Ph.D. thesis at Caltech. His thesis was entitled "Anomalous thermodynamics of nonideal gas physisorption on nanostructured carbons."